Between Parent & Teenager (1967), by Dr. Haim G. Ginott, was published before many of today’s parents of teenagers were born. Ginott, who has been dead for forty years, was a well-known child psychologist and parent educator. His insight was to encourage parents to use the same respectful approach when communicating with their children that counselors use with their patients. The result was this book, and two other classics: Between Parent & Child (1965) and Teacher & Child (1972). “A minor mishap should not be treated as a major catastrophe. A broken glass is not a broken arm. Spilling glue is not spilling blood. A lost sweater need not lead to a lost temper. A torn shirt does not call for an ugly scene. Philip, age fourteen, accidentally spilled nails all over the floor. He sheepishly looked up at his father. PHILIP: Gee, I’m so clumsy! FATHER: You say, the nails spilled – I’ll pick them up! Reading this book again after all these years reminded me of how much the world has changed. But I was amazed at how much of his advice remains vital. He coached parents to acknowledge the feelings of teenagers rather than criticizing or ignoring them. When trying to change behavior, focus on observed behavior – not personality or character traits. Address specific events; don’t generalize or speak in absolute terms. And when giving feedback, do so with love and compassion. Encourage your child to think things through and do things for himself. Great advice! 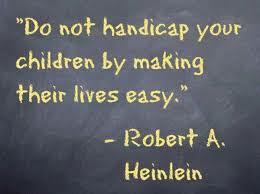 But few parents put this kind of wisdom into practice. I imagine that if they did, they wouldn’t need much more guidance to be effective parents. By the way, I got a used copy of this wonderful book in good condition for one cent plus S/H at Amazon.com. Worth every penny. And in 2018, helping your child develop vital thinking skills is perhaps the best way to prepare them for leaving the nest. My new book: How Your Teen Can Grow a Smarter Brain.